Unitrends Enterprise Backup (UEB) 7.4 for VMware vSphere and Hyper-V is a newly released version of Unitrend’s Enterprise backup solution. The product brings a very innovative set of features that offer additional functionality to a product that is already packed with benefits that enable you to reliably protect enterprise workloads. But before diving into each of the new individual features, I’d like to say a few words about the user interface and deployment options. UEB has two installations: one for VMware vSphere and one for Hyper-V, with the latest vSphere (5.5 U1) and Hyper-V (2012 R2) versions currently supported. The UEB web-based UI is fast and responsive and it’s based on Adobe Flash. After connecting to the UI, you can manage vSphere or Hyper-V environments (or both). You can also add individual (physical) clients which need to be protected. VMware vSphere environments are protected using Virtualization Protector Architecture, which leverages the vSphere storage API For Data Protection (VADP) and using CBT (Changed Block Tracking) for backing up only blocks which have changed since the last backup. To get started you simply add a ESXi or vCenter server (Backup > Add Client ) and all VMs from the environment will show up through the UI. No need to add VM after VM individually. After setting up a master credentials (if all your VMs are managed by a single Microsoft Domain) you can then work on creating schedules and backup retentions. Custom – you’re able to create your own schedules for jobs. In addition you can select a checkbox for auto-include newly created VM. You have options for retention policies as well in the same window, allowing you to quickly select the one you want. But, keep in mind that you also have archiving options for long term VM retention. Archiving jobs are scheduled separately from backup jobs in a different UI window. Archiving can be readily scheduled throughout the day, and archiving to tape libraries is also supported too. Now let us focus on the latest feature set that has been added to Unitrends Enterprise backup 7.4. One of the best new features is the expanded protection of physical systems, which allows customers running on mixed workflows to use single console for their backup/recovery tasks. The feature is called Bare Metal Protection and it’s an enormous advantage from Unitrends since it protects not only for Windows based systems, but also other x86 Intel compatible platforms, Linux, MAC OSX, Novell, UnixWare, and Solaris. Even Cisco UCS. Oracle 12c and Oracle 11g are supported on Windows, Linux, and Solaris operating systems. Newly enhanced Linux coverage now protects CentOS 5.1, CentOS 6.4, CentOS 6.5, Debian 7, Fedora 19, RedHat 5.1, RedHat 6.4, RedHat 6.5, SUSE 11 SP3, and Ubuntu 13.1. Plus, new Linux installers have been added in the latest 7.4 release of UEB and those installers simplify the agent installation process for most Linux distributions. Using Bare Metal Protection isn’t difficult, but you must identify the OS running on the physical host, and then apply the appropriate procedure. In general, for Windows based physical workloads, a special bare metal agent needs to be installed on the system which is used by the backup engine to the bare metal backup option. To meet all the requirements, you need to create a CD bootable media which is based on WinPE bootable environment, and you can do this through the UI. If you are protecting hardware without having an identical spare, then you’ll need a valid set of NIC, RAID, Chipset drivers so the restore operation can dynamically inject those drivers. It’s certainly valuable if you have a mixed environment to have two domain controllers where one of them is running on a physical server. When you check this option, the server can be protected in case that there is a hardware failure. As the domain controller you will want to make sure the weekly full backups with bare metal protection option is checked, and then select incremental backups as desired. 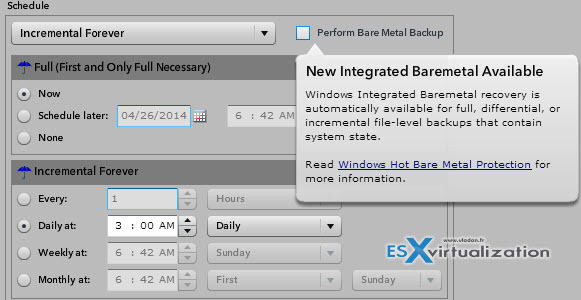 Bare Metal for Linux works in the same way as Windows servers. You’ll need to have an ISO image and run periodically what they call master backups, which are full backups with the bare metal recovery option checked. If you need to restore, you can use the boot from the CD > restore master backup > restore latest incremental backup. But even if you might see those pre-requisites steps as a constraint, they are here to help to leek you protected. 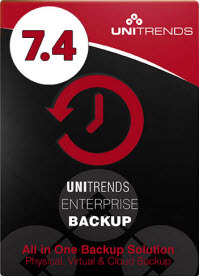 Talking about this allows me to introduce another interesting feature present in Unitrends Enterprise Backup 7.4. This feature is called Unitrends Bridge! Who would have imagined that you could automate P2V conversions by just pressing a single button? Unitrends has done it with 1-click-P2V . This function called Unitrends Bridge allows you to make cold backups (VMs) that are re-activated with incrementals on a daily basis, and are ready to be powered on VMs! So if you experience a hardware failure, you can simply power on those VMs to quickly recover from a disaster! If you lose your hardware raid card or motherboard in a physical server, then what? If you don’t have a DR plan for this scenario, you would be experiencing a very stressful moment in your daily job. You could prevent this happening, however, and mitigate the risk by letting the technology work for you. The Unitrends Bridge feature of UEB transforms the existing physical systems into ready-to-run VMs that are on standby. Those VMs are regularly updated with daily incremental backups. If for any reason you lose your physical system, the VMs can be booted up immediately. So you can assure your boss that until the hardware gets fixed, the virtual environment will be taking over and running things. The technology not only works for servers, but also for clients. Imagine your accountant’s PC crashes—not such an unusual occurrence for a client system with accounting software that may contain all the company’s financial records. Without a regular backup system in place you would have a difficult time recovering vital data. Unitrends Bridge technology can protect these client systems, enabling the physical client systems to be virtualized, and updating them with daily incremental backups. Unitrend’s 1-click-P2V with daily incremental backups can definitely save the day for your most critical systems (and others) for those of us who still rely on physical servers or those with client computers running critical software apps. Oracle 12 c support – Oracle DB running on Windows, Linux and Solaris OS are now supported, including support for Oracle 11G and 12C. With the evolution of virtualized datacenters, admins need to keep pace with evolving demands by using backup products with reliable performance and features that make an admin’s life easier, saving time and effort. One of the features needed most is Instant Recovery. Instant Recovery is supported in Unitrends Enterprise Backup allowing you to quickly restore a VM by powering it up from within the backup repository. 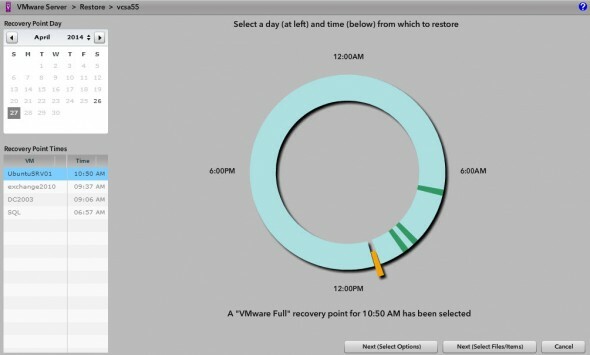 Instant Recovery is currently available for VMware vSphere, and planned for Hyper-V in future releases. This feature allows you to recover quickly so users can work without first waiting for a VM to be restored to its original location. Once the VM is up and running, the administrator can use storage vMotion to place the VM files in the original datastore. If storage vMotion is not available, then the VM must be powered down (outside of business hours) and then cold migrated to the destination datastore. Unitrends Enterprise Backup can easily be configured to replicate to another site, functioning as an offsite repository making it very useful for DR purposes. It enables you to follow the old adage: Better safe than sorry! UEB replication allows you to restore the complete backup system since Unitrends backs up itself automatically, and the backup configuration of the metadata is done on regular basis. The metadata contains backup jobs, storage configurations, schedules, and credentials so that all VMs being replicated to the remote site can be then be restored if necessary. Replication can be combined with archiving so that archived data can be sent to a tape library and a VM which has been archived to a removable media can be restored. There is a difference between replication and archiving however as the replication uses block-level deduplication to the remote site. In the event you need to protect a specific application, like SQL server, UEB gives you the choice between basic protection (without installing an agent) where you will be able to protect Exchange and SQL applications by providing guest-level credentials. During this simple mode however SQL server truncates the transaction log each time the database reaches a transaction checkpoint, leaving no log entries for disaster recovery purposes. When you want deeper protection of SQL, Exchange, Oracle or Sharepoint databases, you would install an agent in those systems, which treats these apps as physical clients. SQL server then uses a full recovery model where the transaction logs are preserved until you back it up. In a DR scenario you can then combine full DB backup with incremental (or differential) backups to restore the DB to a specific point in time, depending on your needs. Untrends Enterprise Backup’s provides numerous reporting capabilities including system reports you can customize by changing column orders and setting them back to defaults, or saving custom reports to run again at will. In the latest version of Unitrends Enterprise Backup 7.4 the reporting capabilities has been enhanced by providing an easy way to create PDF reports featuring charts and graphics. While I was only able to configure a few functions while testing the product in my lab, I can report on the “look and feel” of the UEB 7.4 UI and the product’s overall ability to protect my VMs. I can confirm from my testing that the UI is fast and nicely responsive. Especially when compared with vSphere web client’s UI I can say that the vSphere web client is noticeably slower than UEB 7.4’s UI. 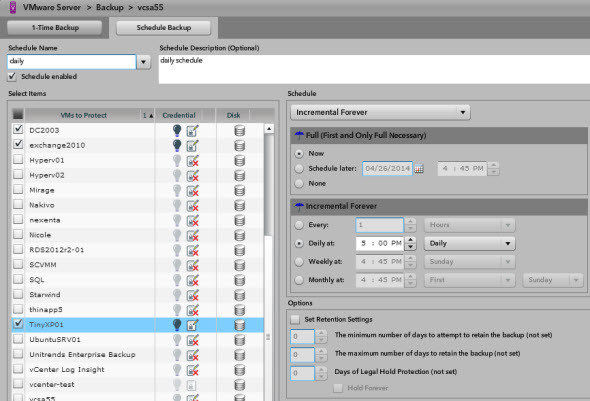 I liked Unitrends Enterprise Backup’s “hybrid” approach best because it allows backing up virtual and physical systems. And these days, vSphere admins have to deal with physical systems at nearly every customer’s site. In smaller companies the physical system can be a desktop PC that is hosting a business critical application, whereas in larger enterprises the physical environment can be an Oracle DB running on physical system. Hardware failures happen all the time, so why put a business at risk when you can protect physical and virtual systems in one solution. 1-click-P2V stands out as an innovative solution from Unitrends for protecting physical systems from failure using a unique management console that responds quickly, enabling fast and efficient centralized backup management. Please note that this review was sponsored by Unitrends.